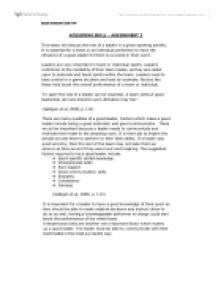 ACQUIRING SKILL - ASSIGNMENT 2 This essay will discuss the role of a leader in a given sporting activity. It is essential for a team or an individual performer to have the influence of a good leader for them to succeed in their sport. Leaders are very important in team or individual sports. Leaders contribute to the mentality of their team mates, as they are called upon to motivate and boost spirits within the team. Leaders need to take control in a game situation and lead by example. Factors like these help boost the overall performance of a team or individual. "In sport the role of a leader can be essential. A team without good leadership can lack direction and ultimately may fail." (Galligan et al, 2000, p. 112) There are many qualities of a good leader. Factors which make a good leader include being a good motivator and good communicator. These would be important because a leader needs to communicate and motivate their team in the dressing room. It is their job to inspire the people around them to perform to their best ability. If a leader was quiet and shy, then the rest of the team may not take them as serious as they would if they were loud and inspiring. ...read more. In a way this makes a leader a role model to the people around them. There are many different styles of leaders. A leader can adapt to different styles to learn how their team responds best. The two main categories of leaders are task oriented and person oriented. A task oriented leader is someone who pays special attention to tactics and has authority within a setup. They tend to have a very good understanding of the sport in which they are involved and this may be the reason that they were appointed as a leader. Task orientated leaderships links in with the style of autocratic leading. This is when the leader is very much a controller and they make decisions for the team to follow. "They dictate what should be done and the group are expected to follow" (Windle&Sprarks 2007 p32) An example of a task orientated leader in an individual sport would be Colin Jackson. He is very knowledgeable in athletics and so would take a more tactical view on leadership. A person orientated leader, on the other hand, would have much better inter-personal and communication skills. This would make them much better motivators, although they may lack a little knowledge about the game. ...read more. for example with teaching younger children the autocratic style of teaching would be best because younger children require a leader to take control, they would also expect the leader to behave in autocratic way. Also when leading young children a leader must take into account the age of the children as this would determine the style of leadership needed, many female tennis players play at their best when they are in their teens. The gender of a performer may determine the style of leadership required, women may often be perceived differently as a leader, however a leader should take into account the gender of a performer as they are expected to behave in a certain way. To conclude; Different styles of leadership are more appropriate and successful in different sports and situations. "Thee position, the approach and the role of the leader will often depend on the situation and the group itself." (Windle, Sparks Acquiring Skill p.29) These different situations may need different styles of leadership. 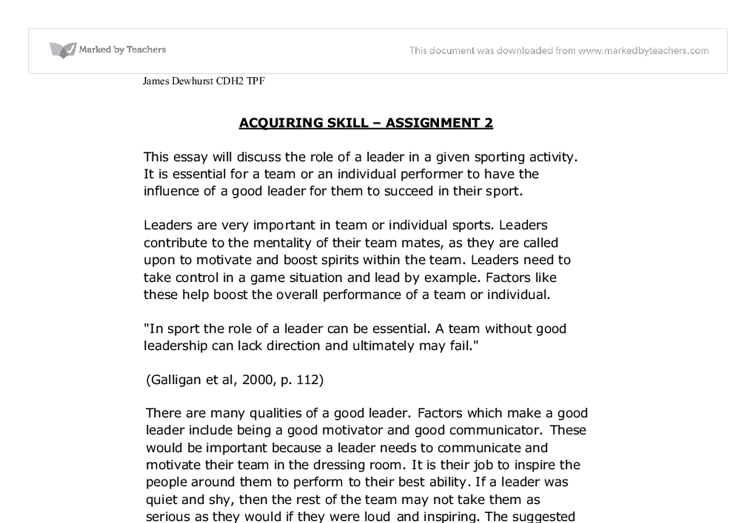 For example an athletics coach would find it much easier to be person orientated than a rugby coach. This is because athletics is more one to one. Resources Books: Galligan et al Advanced Physical Education Through Diagrams Windle, Sparks Acquiring Skill Internet: htpp://www.brianmac.demon.co.uk www.au.af.mil/au/awc/awcgate/acsc/99-061.pdf Word Count 1285 ?? ?? ?? ?? James Dewhurst CDH2 TPF ...read more. Feedback and Reflection After the interview, we reviewed the way in which we both performed individually, and in tandem, during the exercise. We both agreed that she effectively controlled the direction and pace of the conversation, as we often allowed her to elaborate into subject areas that were not originally inquired about. She specialises in specific sports such as netball and hockey but she is also able to adapt to different sports and teach them to a range of abilities as well. Miss Howden is always leading sessions therefore she is confident and able to deliver session well through her experience and practise. Jump over the hurdle without hesitating. Then try the same thing with a partner serving the ball, so that you have to jump over the hurdle to head the ball. Jumping over an obstacle is a great method of learning the diving header as it forces both feet to leave the ground.